Do you remember when the readers of this blog were asking me to write an article that explained why it was easy to see DID ? If you don’t recall this conversation, have a look back at the comments in the article, “How Many People Have Dissociative Identity Disorder”. That article sparked a very interesting conversation with a small group of blog readers. And that conversation has had a lasting impact. Because at that exact point in time – without their awareness – I was searching for the perfect topic to present in a Free Report that would be given to those who were willing to request ongoing information via my brand new email newsletter that was being developed. I have been very excited to finally have a way to communicate with and stay connected to all the different folks – the unique souls, the quiet ones, the scared ones, the forgetful ones, the hidden ones, the dissociated ones, the students, the therapists, the supportive partners – anyone who come reading through this blog. While my wonderfully skilled web technician worked the technical bits into reality, my job was to write. To write with quality. One of my first goals was to create a written gift – a free report – to give the readers here. I needed to write something informational, full of meaning, something that would have an impact, something that would be helpful to the masses over an extended period of time. I wanted the perfect topic. The perfect topic for my Free Report. The perfect Free Report to kick off the new Email Newsletter feature offered at the new blog platform. So what does a perfect topic look like? I know there are at least these four different groups of folks reading here at Discussing Dissociation and the perfect topic needed to be valid or interesting for ALL the readers. How on earth was I going to find a topic that would be of interest and value to all four of these different perspectives at the same time? I was being picky, and nothing “just right” was coming to mind. Then it happened – right before my very eyes, by you, the faithful readers of this blog. Within a week of my searching and searching for the perfect topic, the blog conversation on “How Many People Have Dissociative Identity Disorder” took place. “So Kathy.. Since it is obvious to you what to look for, questions to ask, we think it is important to put an article out there for professionals that DO have a willingness to see that. We KNOW first hand the many high numbers of times we have been refused treatment just because of the misunderstanding of DID. Have had more than one psychologist refuse to treat because the “borderline issues” show up. More than 10 professionals we have seen run because of this. The other part is fear. Professionals are not like you. They fear this. They freak when an angry part shows up in their office. They send a person away when a child part shows up that has been taught that death is the only option there is.. How sad is that!!!! “The numbers of people living like this is enormous but, as everyone is saying – so many just don’t want to see. Of course they don’t want to see, as to see how many people have DID is to see and admit to how much harm apparently ordinary people in our society are doing to children they are supposed to care for….. Thank you, each of you who were writing comments for that article – because each of you has now helped to create what I think is a fantastic new resource for people interested in learning about DID. Why is it important to understand what DID looks like? It is important to understand what DID looks like so you can address the issues you are experiencing with greater ease and with deeper kindness for yourself and for your insiders. Knowing what is “normal” in the realm of DID will help you to understand that what you are experiencing is actually realistic, typical, not weird, understandable, and to be expected for someone who is dissociative. The more you understand about DID, the more you can understand about your own system. You can use this information to find your insiders, or to support your insiders, to have empathy for them, and to help meet their needs. And who needs to waste time in therapy trying to re-invent the wheel? Having guidelines and solid system information available for you can help save you time, money, energy, and resources in your therapy process. You won’t have to wander around so lost in the process if you have a little guidance. As you can see in the Free Report, there are many elements to DID, and when you put a majority of those elements together into one life picture, it’s easy to see. The different insiders are visible. The effects of having different lives are visible. The effects of the trauma are visible. But you can see your own insiders, which is the very most important piece of the puzzle. You getting to see and recognize your own system is the most important. And once you know more about your own system, you may choose to allow the outside people who offer safety in your life to have the opportunity to see your system as well. We will talk more about all this in the days, weeks, months to come. 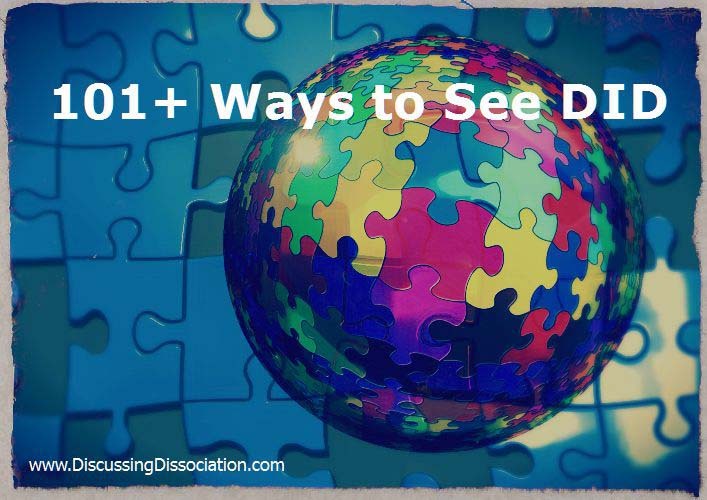 Please do enjoy your Free Report, 101+ Ways to See DID – Dissociative Identity Disorder Described. If you have any trouble downloading the report, contact me. Also, please note: you may need a PDF app on your phone if you are downloading the report on your mobile device. Keep spreading the news to everyone you know who might need to see what DID looks like. If they can’t see DID, invite them to come here and sign up for their own copy of the report so they can learn more about DID. Add the link for www.DiscussingDissociation.com to any forum or support group or therapeutic site that needs more quality information about DID. By working together, we can help teach the world what to see! And while you’re out there, have a good look around the world…. You just might see DID more often now! Filed Under: DID Education, DID/MPD, Dissociative Identity Disorder, Featured post #1, mental health, Online Therapy, Therapy Homework Ideas Tagged With: 101+ Ways to See DID, describing DID, DID Described, DID diagnosis, Dissociative Identity Disorder, Free Report about DID, How to see DID, recognizing DID, Seeing DID and switching, what does DID look like? If you are seeing this, you are seeing the newly updated Discussing Dissociation blog !! The site becomes will become live to servers around the world over the next 48 hours. When it’s live , the web tech person will be able to attach the Free Report to the site. yay kathy, this looks great!! But where is the report? I’m not understanding ..I’m excited to read. We all like you Kathy, really like it when you read story’s. And you explain in a way that I can understand. I like your metaphors. Thank you, looking forward to reading all the articals. Much Aloha’s, Sarah Grace. Test reply – comments are now working! 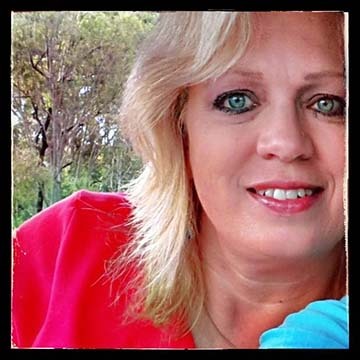 Hi Kathy- Congratulation on getting the new site up and running. We’ve missed you. It looks great and is easy to navigate. My family will find it very helpful too. Thanks for all your efforts. P.S.- I can’t find the report either. Thank you, Debbie. I’m glad to hear the site will be helpful for you and your family – that’s the whole point, right?! 🙂 . There are still lots of updates to make to the site, and features to add, but those things can take place from here, while the site is live and available for everyone to have. The report: 101+ Ways to See DID — is connected to the site now. It took a few more days of technical work before that could happen, but it’s here now, and folks are able to get their copy. You can get yours too – via the email optin’s that you’ll see around the site. MK — can you see the new site now? It’s been going through a variety of up’s and down’s during the transfer process. It was visible, then it wasn’t, and now it should be again. I had to clear all my cache history on my browser to be able to see it right. You might have to do the same??? Okay — I’ll give y’all a bit of an update. As you can tell, things are still mid-process with the “making the new site” work properly. We’ll need to give the web tech person a little bit more time to get those techie things worked out. When everything is working correctly in the technical level of things, she’ll be able to attach the Free Report to the site. Right now, there are some bumps with my email attached to here, so please note — if you are SENDING email to me, I’m not going to be able to see it. I haven’t received email for a few days now… hmmph! Also, for some reason, I’m unable to post some of the comments that have been made. Weird, because I was able to approve and post some before, as you can see. We’ll get that sorted out, I’m sure. As always, I highly appreciate your comments… so just know we’re working on that. But hey — we’re here now, and THIS is great news, because it’s the first step in the process. improvement to and already awesome website 🙂 Good job Kathy. to get the report either. Thank you, Pilgrim. I see you found the Free Report after all. Anyone can have a copy of 101+ Ways to See DID through the email optin. There is no direct link for it on the site — it comes through the newsletter option in the various ways that folks can sign up for that. And YES !!! It most definitely took hours upon hours of hard work. Weeks upon weeks, actually. It will be easier to do the next eBook’s, because I’ve learned a lot while figuring out how to do this first one, but yep…. definitely a looooong process. Glad you like it. Hope it’s helpful for you. Looking forward to connecting back with your site and valuable information. Thank you for caring about us! It’s good to be back, and it’s definitely good to be back in communication with you all again. We are new to the DID diagnosis, but have been reading all of your old site information and so happy to see your new site and communicate with others who can understand and walk this journey with us. So glad you are back. I just found how to leave a comment. Even though always been multiple still find it hard to accept as counsellors keep leaving us with the message that we are too bad for help. Your blog makes us feel normal finally. Did you get a chance to read through the 101+ Ways to See DID eBook ?? If that eBook describes a lot of what your “normal” life is like, then you are very much “normal” for a dissociative person. Of course everyone is unique to themselves, but lots of the areas listed will be a common experience for folks with DID. Those statements are the hardest for me to hear. I can’t accept responsibility for actions I either don’t remember or was actively protesting and trying to stop during their occurrance…. I am no longer letting people who misunderstand me and hurt me or ANY of my parts around this body, or near these eyes. I need to take care of my team. Your blog has been a great learning tool for me. Probably more so than therapy and group therapy combined. Its SO much less scary here than in the big textbook we use in group. It is so nice to see other survivors speaking in their own words. 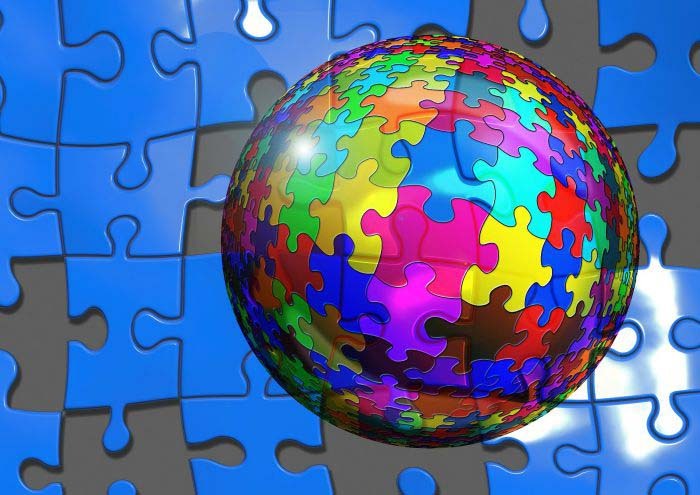 Welcome to Discussing Dissociation, and thanks for your comment – I really appreciate that. I am very very glad to hear that you are finding these resources so immensely helpful. That’s fantastic news. And yes… seems there is a definite need for more info for supportive friends and family, so we might just have to work on that here soon. Team protection is very very important — keep working on that one. The Do People Say These Things to You? page is definitely a tough one. It’s enormously painful to hear those comments, and yet so many DID folks do hear that stuff from others, even from people who care about them. One of the main reasons I made that page all tipsy-turvy like that was to make it a bit hard to read so that all the “yuck stuff” had a bit of distance for the reader. Thanks much for your comment, and I hope that you continue to participate here. I agree with you —- the comments from the other dissociative readers are so extremely important, so yep… keep on writing!